Joachim Murat, master of horses and courage, charged again and again into enemies to tilt the battles in his master Napoleon Bonaparte’s favor. Dashing hussars in beautifully braided dolmans and fur-lined pelisses; chasseurs in their brilliant green uniforms; the heavy cavalry of cuirassiers in their glistening breastplates, mounted on magnificent chargers; and the dragoons, wearing brass Grecian helmets with long, flowing manes of black horsehair—all magnificent in their martial and fashionable airs. Thundering and sweeping across the plains of Europe, these stylish and brave horsemen were led by the most gallant and courageous French “Beau Sabreur” of them all, the valiant and towering Joachim Murat. Ney and Lannes handled Napoleon’s infantry spectacularly; Marmont directed the artillery admirably; but no one commanded the French cavalry with such daring heroism, brilliance, and glory as this swaggering Gascon who would one day become a king. 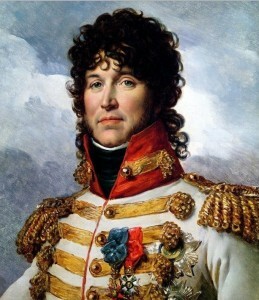 Joachim Murat was born March 25, 1767 in the village of La Bastide-Fortunière in Gascony. He was the 11th and last child of innkeepers Pierre and Jeanne Murat. Through the influence of Talleyrand’s family, young Joachim was sent to a seminary. However, the “Abbé Murat” loved horses and since childhood he could ride like a young Bedouin. When a regiment of chasseurs appeared at Toulouse, the adventurous lad joined them. In April 1793 he was a captain; by May, a major. It was in October 1795, when the National Convention in Paris faced a riot by Royalists, that an emaciated artillery officer with a commanding air asked Murat to go to Sablons and return with the 40 cannon there. By six o’clock on the morning of October 5, Murat galloped back to the Tuileries with the guns. That day the artillery officer fired his “whiff of grapeshot” at the crowd and, by saving the Convention, founded his fortune. His name was Napoleon Bonaparte, and when he left to take command of the Army of Italy on March 9, 1796 he took with him Colonel Murat as his first aide-de-camp. Murat’s daring and efficiency had impressed Bonaparte. With the words “honor and the ladies” engraved on the blade of his sword, Joachim Murat was about to begin his career as the world’s greatest swashbuckler. The dashing Murat was actively engaged in all the battles of Bonaparte’s 1796 Italian campaign. At Dego, he led his first charge in a pitched battle. His wild dash into the Austrian ranks was so effective that he received honorable mention in his commander’s dispatch to the Directory, the government of France. Against General Colli’s Piedmontese army at Mondovi, Murat rallied a broken brigade of cavalry, led them again to the charge, and drove the beaten enemy across the Ellero River, fording the stream to charge them again on the farther bank. He was beginning to demonstrate his sharp eye for terrain and his unique talent of inspiring others with his own reckless daring. Indeed, it is this magnetic power of imparting his own courageous spirit to hundreds and eventually thousands that is the most valuable trait of a great leader. On May 10, 1796, at the age of 29, he was rewarded by the Directory with a promotion to the rank of Général-de-Brigade. During the Battle of Veleggio on May 30, General Murat charged the Austrian cavalry and completely routed them. While commanding Kilmaine’s cavalry division, he cut off the retreat of most of the Austrian soldiers and captured 2,000 prisoners, nine guns, and two standards. Bonaparte praised this indispensable cavalry commander for his personal acts of valor in the victorious attack, and for his rescue of many French chasseurs who had been in danger of being captured by the enemy. At the end of June 1796, Murat led a sudden raid on Leghorn. By July, however, he was suffering from malaria. While recuperating in Brescia, he began his conquest of the beautiful Madame Ruga, wife of the local lawyer, proving his skill in the boudoir as well as on the battlefield. As hostilities once again increased, Murat was recalled to action. On September 15, at San Giorgio, he was wounded while leading a successful charge against General Wurmser’s Austrians. In January 1797 the Austrians attempted to relieve Mantua. As the main Austrian army confronted General Bonaparte, the impetuous Murat was to deliver a bold stroke against the Austrian flank and rear. Panic seized the Austrians as Murat’s guns blazed from this unexpected area, confirming that they were surrounded and causing thousands to surrender immediately. During his attempt to storm the suburbs of Mantua, the intrepid cavalier received a saber cut on his arm. His future brother-in-law, General Leclerc, called him “that Madman Murat!” Napoleon Bonaparte, in his report, paid high tribute to the brilliant service Murat had rendered him in the great French victory at the Battle of Rivoli. On February 3, Mantua, at last, surrendered. By April 1797, the Austrians had been driven back to Leoben and forced to request an armistice. Bonaparte paid a visit to his family at the castle of Mombello near Milan, accompanied by his brilliant cavalry commander. From the moment she met him, Napoleon’s sister, Caroline Bonaparte, then a beautiful 15-year-old girl, fell in love with the 30-year-old cavalryman. His robust six-foot form, adorned with a gold-braided jacket and skin-tight cavalry breeches, as well as his dark Gascon features, blue eyes, long mane of jet-black hair, and sensuous lips were enough to make any girl swoon. Caroline Bonaparte was excited by the towering man who kissed her hand; he, in turn, was seduced by her beauty. The love they shared would last all their lives. On May 19, 1798, Murat accompanied Napoleon to Egypt. He took part in the capture of Malta and Alexandria, the Battle of the Pyramids, the suppression of the revolt in Cairo, the capitulation of Jaffa, and the siege of Acre. But he became greatly discouraged when he saw that his daring cavalry tactics were no match for the great speed of the wild Mameluke horsemen. During these battles, he usually found himself deployed in the center of the French infantry squares. It was not until April 15, 1799 that Murat, with only two cavalry battalions, routed 5,000 enemy troops at Lake Tiberias. The victory was all the more remarkable because the French did not lose even one man. As Napoleon returned to Egypt from his unsuccessful Syrian campaign, the commander-in-chief now had to face a Turkish force of 15,000 soldiers landing at Aboukir. Bonaparte was confident that his thousand cavalry troopers led by the fiery Murat could destroy the Turkish army, whose own cavalry still remained on board the British transports. The land Battle of Aboukir took place on July 25, 1799 and began with General Jean Lannes battling through the Turkish entrenchments, while Murat, mounted on a magnificent charger, swept down upon the enemy with such ferocity that the terrified Turks scattered before him. The gallant Gascon towered over his enemies and at last came upon his nemesis, the Turkish leader, Mustapha Pasha, who aimed his pistol and fired a bullet through Murat’s face. Indifferent to the blood and pain, Murat flashed his saber at the Turkish leader, disarming him and cutting off two of his fingers. Mustapha Pasha surrendered and the Army of Rhodes was no more. Thus the French “War God” was victorious. Although badly wounded, Murat was one of the special entourage who accompanied Bonaparte back to France through the British blockade of Egypt. Then once again Murat was called upon to save his commander, who had faltered badly as he addressed the Council of Five Hundred. Murat, at the head of 60 grenadiers, forced the Council out from the Orangerie at St. Cloud and established Napoleon Bonaparte as ruler of France. As a reward for his invaluable service during the Coup d’Etat of 18 Brumaire, Joachim Murat, despite his low birth, married Caroline Bonaparte, on January 20, 1800. Brother-in-law to France’s great leader, Murat’s fortune was now made. After a brief honeymoon, Murat was called upon to command the cavalry of the Army of Reserve. For his notable achievement at the Battle of Marengo, he was awarded a coveted saber of honor. He held many important positions in Italy until June 1802, when he became Governor of Paris. It was during this time that the infamous court-martial of the Duc d’Enghien occurred. Murat denied any part in this affair. On May 19, 1804 he was appointed Marshal of France, and on February 1, 1805 he became Grand Admiral and was named Prince of the Empire. During the campaign of 1805, Murat was assigned to organize 22,000 troops into the Cavalry Reserve, whose main responsibility was to create a screen between the main French Army and its adversaries. He was enormously successful. Austrian General Mack surrendered at Ulm without a shot when he realized, too late, that he was completely surrounded. On November 12, Murat reached Vienna and captured 500 cannon and 100,000 muskets. But then the Austrians were about to destroy the main Vienna bridge. By a magnificent display of bluff and daring, Murat, together with Lannes, personally convinced the Austrians of an armistice. With Oudinot’s grenadiers, the bridge was captured without loss of life. On December 2, 1805 Murat played a vital role at Austerlitz where both the Austrian and Russian emperors were defeated. With sword in hand, Murat and his Cavalry Reserve swept away Bagration’s infantry and Lichtenstein’s multitude of splendid enemy horsemen, capturing many standards, 7,000 prisoners, and 27 guns. On March 15, 1806 Murat became Grand Duke of Berg and Cleves. Murat had no time to enjoy his new principalities, however, for on September 29, 1806 he began supervising the concentration of the Grande Armée in Bavaria. His greatest achievement in the field was about to take place. Murat’s Cavalry Reserve comprised D’Hautpol’s and Nansouty’s cuirassiers; dragoons commanded by Klein, Grouchy, Beaumont, and Sahuc; Lasalle’s hussars; and Milhaud’s chasseurs. Soon they were joined by General Espagne’s cuirassiers. On October 14, 1806 this formidable array of horsemen charged the Prussians at Jena and never faltered until virtually every enemy soldier was captured. The legendary pursuit of the Prussians, preceded by the Battles of Jena and Auerstadt, is among the most spectacular exploits ever achieved by cavalry. The day following these battles, Murat boldly fell upon the retreating enemy at Erfurt, capturing 14,000 men, a hundred guns, supplies, General Mollendorf, and the Prince of Orange-Nassau. On October 20, Murat, with Ney’s assistance, captured the fortress of Magdeburg. By October 25, the fortress of Spandau surrendered to the determined cavalryman whose hell-for-leather pursuit next captured Hohenlohe’s army at Prenzlau on the 28th. Prince Hohenlohe, Prince Augustus of Prussia, 14,000 infantry, and 2,000 cavalry became prisoners of war. French General Lasalle, Murat’s subordinate, next succeeded in capturing the fortress of Stettin with his blustering claim that he had thousands of troops surrounding the fortress when, in fact, he had but his own regiment of hussars. Lasalle then took 3,500 prisoners at Anklam, while Murat spurred on his troopers to capture Blücher at Lübeck, on November 7. As Blücher surrendered with his 15,000 soldiers, an elated Murat quipped, “The fighting is over for lack of opponents.” Thus, within three weeks, Murat’s untiring energy and resolute command of the Reserve Cavalry had successfully killed, wounded, or captured every enemy soldier in Prussia. 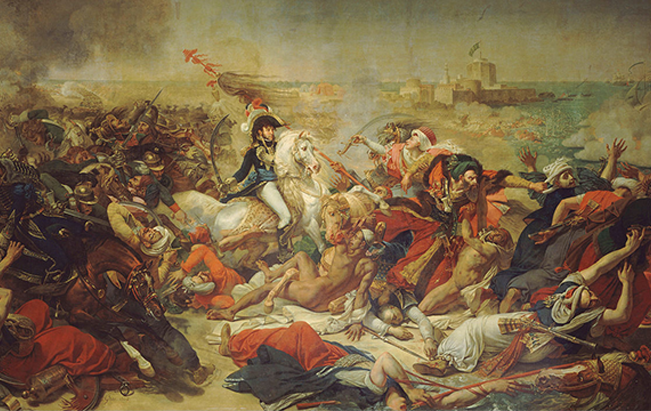 At the terrible Battle of Eylau, Murat’s cavalry with its bold charge rescued Napoleon and his army. This bloody holocaust, fought in the midst of a blinding snowstorm, seemed more like a defeat than the victory it was. But for Murat’s death-defying courage and tactical skill, Napoleon would have lost everything. The battle took place on February 8, 1807, and the numerically inferior French witnessed the end of their belief in their own invincibility. Advancing through the blizzard, Marshal Augereau marched directly into the murderous Russian artillery, which blasted his ranks, while the Cossacks, with their lances, struck down the survivors; a mere 1,500 of an original 16,000 survived. Napoleon was now in a dangerous situation. With the annihilation of Augereau’s corps, the center of his army virtually ceased to exist. A desperate emperor implored his brother-in-law, “Are you going to let those fellows eat us up?” Nothing could have fired up the dashing Gascon’s passion for battle more. At the head of 80 squadrons of some 10,700 troopers, Murat’s roar of “Charge!” could be heard across the battlefield. One of the greatest cavalry charges in history was about to begin. The earth shook and trembled as Murat’s thundering horsemen plunged down upon the enemy. Flashing sabers, glistening helmets, and frothy breath steaming from horses’ nostrils became visible through the falling snow. France’s “God of War” appeared in his gold-embroidered uniform and towering ostrich-feather plumes. Mounted on his noble horse, astride a great leopard-skin shabraque, he could be seen as a thunderbolt, flying across every part of the field. Murat and his men fought gloriously in brutal sword-to-sword combat. Amid the bombs blasting from Russian cannon, the crackling rattle of the muskets, and the falling saber strokes of the enemy cavalry, Murat’s lofty white plume never faltered. Napoleon’s “right arm” was still inspirational and striking out for victory. At the apex of the charge, Murat controlled the bridle with his teeth, a pistol in one hand, and his drawn sword in the other. He drove in full gallop upon the Russian infantry’s leveled muskets, scattering them. At last the gallant Gascon and his men made their way back to their lines, having destroyed the Russian gunners who had so horribly damaged Augereau’s corps. The charge had averted a great disaster and saved Napoleon’s Grande Armée. Joachim Murat at the Battle of Aboukir. In the closing days of the Empire, Murat would repeatedly provide Napoleon with his invaluable service in Spain (as King of Naples), at Borodino, and at Dresden. As his Emperor continued to pursue the course of his own destruction, Murat, as King of Naples, attempted to hold on to his own kingdom in Italy and began negotiations with his enemies. But this steadfast loyalty for Napoleon eventually cost him his kingdom and his life. Tags Battle of Aboukir, Battle of Eylau, Battle of Marengo, calvary, Chasseurs, Egypt, France, Marshal Joachim Murat, Napoleon Bonaparte, Napoleonic Wars, Prussia.